Help us by sharing and liking this post! XII. During the term of this agreement the Author shall not publish or permit the publication of any material written in whole or in part by him that is derived from or competitive to the Work or the rights herein granted without the prior written consent of the publisher. [Then Srila Prabhupada added]: except for Back-to-Godhead Magazine, and any present or future works using the Work as reference, as well as the 48 pages of illustrations for which the Author reserves the right to publish for any purpose he may determine. Srila Prabhupada made other notations also, including his right as Author to translate into foreign languages if the publisher failed to do so within 18 months. He then signed as the Author. The contract was dated March 6, 1972 and countersigned by the ISKCON representative, “Rupanuga das Adhikary”. That new Gita was to prove big and heavy and only so many could be crammed into a bookbag, but people were to become immediately attracted to the gorgeous, colorful paintings; besides, where could they find such a book with so many color illustrations, and for how much? It was Srila Prabhupada’s transcendent genius to conceive of such a way to reveal to people the deepest philosophy and the highest truths comprehensible to human beings. No other volume of supposed philosophical content could compare to that Gita, decorated as it was with paintings allowing a view of the Spiritual Sky. Along with Prasadam, those paintings were Srila Prabhupada’s secret weapons. Prabhupada and his editor, Hayagriva Prabhu, worked together on the “original manuscript” and the end result was “coward” instead of “fig”. But somehow the BBT International decided to replace “coward” with “insignificant”. On the BBT International’s website we do not find any information about this change and why it was made. This is a significant point because Jayadvaita Swami have now published up through the 8th chapter what is claimed to be a detailed justification of all his changes. But somehow he has left this one out when going through the changes in the second chapter. Why? In the word-for-word translation to Bg. 2.35 Prabhupada translates the word “laghavam” as “decreased in value”. But nowhere does Prabhupada translate “laghavam” as “insignificant”. When searching the Vedabase Folio we find nowhere in Prabhupada’s books, lectures, conversations, letters where he refers to Arjuna as being “insignificant” in the context of Bg. 2.35 – or any other context. So how is changing “coward” to “insignificant” going back to “the original manuscript”? And in which way is it “closer to Prabhupada”? This particular lecture is from 1968. 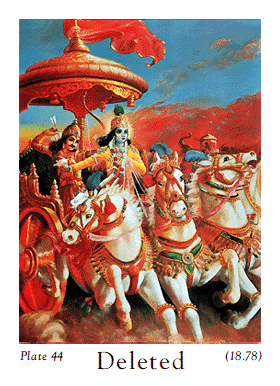 Prabhupada had at least three years to demand “coward” changed in the 1972 Complete Edition. He didn’t. Besides this obvious point the two words do not at all mean the same. The words “fig” and “coward” are both used in a derogatory meaning by Prabhupada whereas the word “insignificant” is much more neutral. Logically speaking a coward doesn’t need to be insignificant, and an insignificant person need not be a coward. So the two words can’t be synonymous. I’ve heard a devotee claim that calling someone a “fig” is outdated, and that the BBT International decided to find a better word with a similar meaning. This is of course already defeated with the arguments against going back to the so called “original manuscript”, and the fact that “fig” and “insignificant” are far from synonymous. But additionally it would mean that the BBT International would have a double standard since they have kept the sentence “On the other hand, the forces of the Pandavas are limited, being protected by a less experienced general, Bhima, who is like a fig in the presence of Bhisma.” (Bg. 1.10 purport, the 1983 BBT International edition). So is this really an “insignificant” change? You decide! So all of a sudden Jayadvaita Swami remembers what happened: a real good story of several “manuscripts”, and the real original manuscript missing. So we have different manuscripts, and we have Jayadvaita Swami changing on the basis of his “impressions” (clearly not a recognized source of knowledge and clearly not the standard method used by editors). 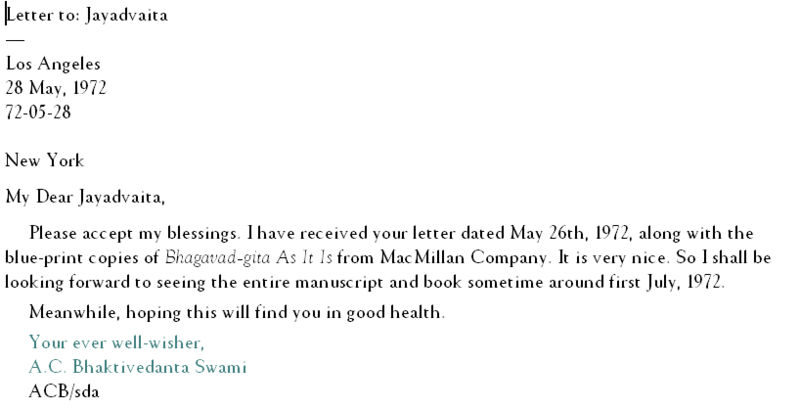 Jayadvaita Swami thinks that if we are missing what he has told the world is the “original manuscript”, then we just take one of the other available manuscripts, and if we happen to make a mistake, then we just reverse it next time. What is the problem? Is this the way we to honor sacred books and help them stay authoritative in the eyes of the people of the world? 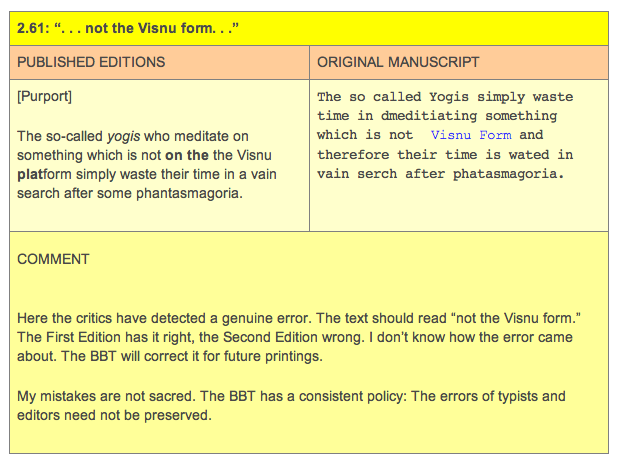 So Jayadvaita Swami is fallible, and he is able to admit his mistake in regard to “Visnu platform”. But why, then, will he not admit all the other mistakes he has made? Devotees have been documenting his mistakes for years, but he will not admit them. Why? 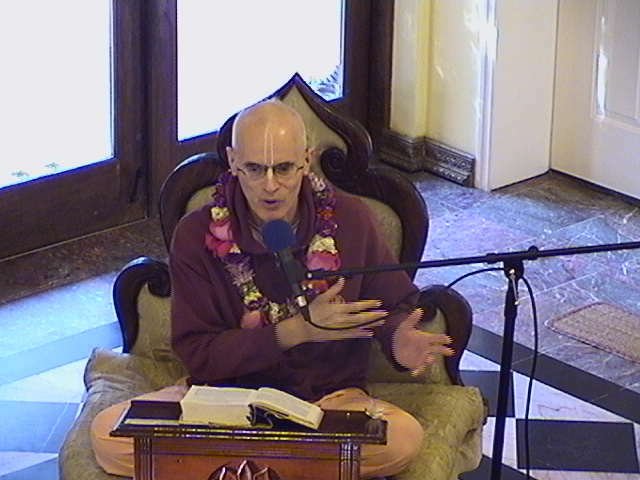 In the last part of the video Jayadvaita Swami says that we should apply a principle of being “as close to Prabhupada as possible.” And this is true. 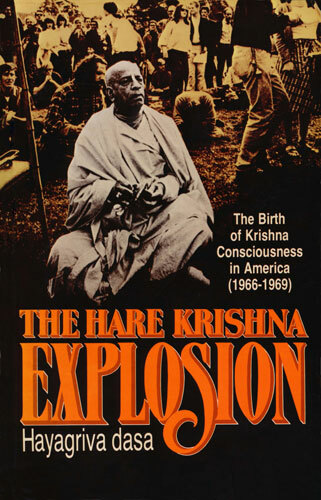 But what is closest to Prabhupada – is it his many earlier drafts or the final book he himself completed together with his editors and which he approved, published, called the “Complete Edition” and “Definitive Edition” and read, lectured from and distributed for years without asking for more than 1-3 mistakes corrected? Why will Jayadvaita Swami not admit that his biggest mistake is that he bases his editing on the mistaken idea that we can change the final, approved book back to its earlier drafts (of which there are many)? 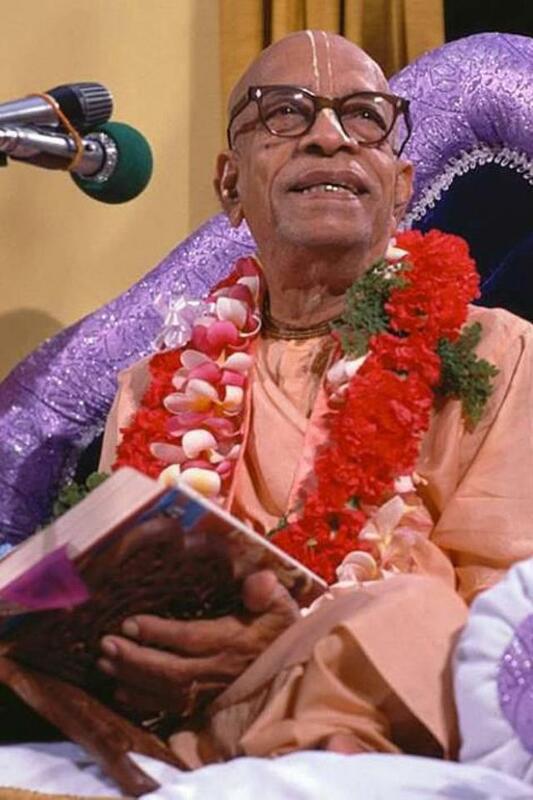 And why will he not admit that it is logically impossible to correct ALL mistakes in Prabhupada’s books without violating the arsa-prayoga principle of not correcting the acarya? A principle Prabhupada demanded that we follow. Being close to Prabhupada can be done by honoring the arsa-prayoga principle and accepting Prabhupada’s book as he accepted them himself.